Philippine Tourism Secretary Ms Bernadette Romulo-Puyat was most gracious to accept under very short notice my request for a brief meeting. I was advised of her extremely tight schedule including island travels and therefore didn’t expect to be given time. After a day’s wait, her efficient secretary promptly messaged me and followed with a personal call. I knew the 3 decades since last we met was reason enough to sit and patiently wait at the Office of the Secretary, Department of Tourism DOT in Buendia, Makati. So there I waited beyond the appointed time, something which the Swiss, in my case, Swiss-Filipino is no longer used to but in patience, perseverance is born. And in fairness, the Swiss set appointments way in advance. Berna, as everyone fondly called her during her Assumption high school years in San Lorenzo Village Makati, met me from the side door of the conference room heavy with apologies. The warm welcome hug dispelled the monotony and fatigue of the long wait. And she called me Maam!! ‘Betsy suffices,’ I assured her. Searching those sparkling eyes and listening to one distinct excitable voice flashed memories of unforgettable years with a bunch of fun, rambunctious, talented girl teens who inspired, wrote their poems under the trees or sitting on grassy parks and performed Shakespeare at the Mother Rose Auditorium under my wing. Berna’s batch was my first teaching experience after graduation. After 4 years of high school, I too ‘graduated’ with them and moved on to an exhilarating human resources career spanning continents. Our brief chat immediately turned to invitations – to the European Network of Filipino Diaspora ENFiD Europe’s October 19-21, 2018 Paris Conference and General Assembly. She is scheduled to fly to London in the last week of September and may not have the chance to return to Europe in October. She mentioned the invitation to the Filipina Women’s Network FWN awarding ceremony in London by mid-September but also had to regret the occasion. Uttered with conviction, her mandate now is to focus, prioritize and promote the country by visiting locally. When asked about her Tourism programs for Filipino balikbayans and returnees, she said there are current DOT programs available but when we do plan ENFiD’s programs, to contact the Department of Tourism for possible engagements. 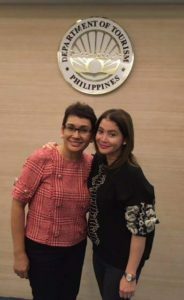 Asked about the Commission on Filipino Overseas CFO’s Lakbay-Aral particularly for our second, third generation Euro-Pinoy or YENFiD which aims to connect our youth while promoting Philippine arts, culture, history and tourism, she reiterated her interest by contacting the Department of Tourism. In my communication with Ms Romulo’s office prior to the afternoon visit, I brought up the case of 7 year old Gaia Cabanlong Trimarchi, Filipino-Italian girl who tragically lost her life while on holiday with family due to deadly box jellyfish in Caramoan. The prompt response of the Department of Tourism included current coordination with the Regional Office of the said destination in gathering facts and addressing the issue. As Secretary Romulo-Puyat and I concluded the brief conversation, I knew ENFiD-Europe has found another robust connection at home on behalf of our million-strong EuroFilipino diaspora. On a personal basis, I reflected on being an educator and its rewards unique to this profession. One of my students has grown to be a woman of substance, a woman of influence for a humane, just, respectable and God-fearing society. 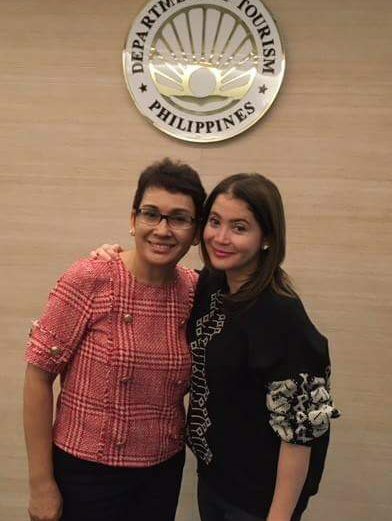 I am proud of you, Ms. Tourism Secretary. ENFiD, the European Network of Filipino Diaspora, is a civil society non-profit organization of Overseas Filipinos with 17 Member Countries. ENFiD is the first Europewide cross-sectoral, all-inclusive Overseas Filipino organization that has genuine developmental ambitions translated into timely and relevant actions for Euro-Pinoys.